These minimal abstract designs will add a pop of color and a playful touch to any coffee and dining table. Handmade in San Francisco by a small business. 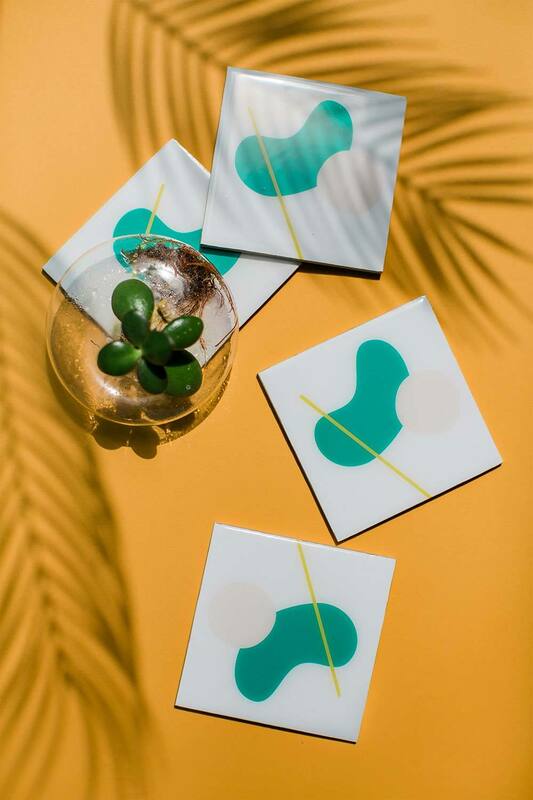 The Abstract Green Resin Coasters are designed and handmade in the Esselle San Francisco Studio, so you can bet these designs are one of a kind and produced by a small business maker! These minimal abstract designs add a pop of color and a playful touch to any coffee or dining table. Resin is waterproof and heat resistant up to 160°F. Esselle is a tabletop decor brand based in the San Francisco Bay Area. They are a small business owned and operated by women passionate about designing and developing wares that are beautifully hand-crafted and also purposeful for all occasions; from serving your wedding to home entertaining. Details: Set of 4. Wipe with a damp cloth. Do not dishwash or rinse.